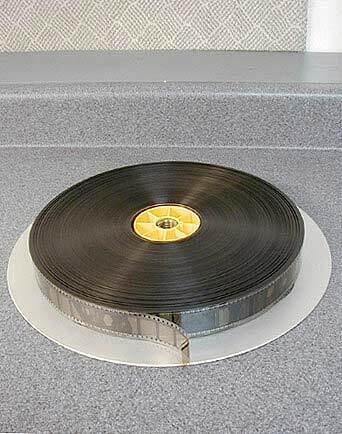 I was wanting to buy a 35MM cartoon short, and i was asking the seller if it could be put on a reel, and our conversation wandered onto "platter" or "reel' 35MM projector. The seller of the print said that there is no difference. 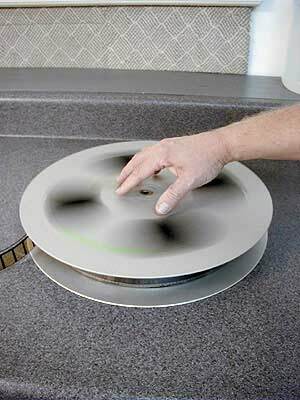 Are "platter" 35MM projectors capable of taking an old school 35MM "reel" of film? I would have thought that, being that an old school 35MM projector would have arms for the front reel and the take-up reel, that those more modern "platter" projectors don't have the arms for an old school reel? The platter is a completely different set of gear from the projector. It, and towers, will hold the entire program of 35mm. The film feeds to and fro with the projector. However, most 35mm projectors will have spool arms just like a 16mm or 8mm. If you wish to buy, I suggest you ask for the film to be supplied on a core. I'm not too sure about the US but here, in the UK, different makers of 35mm projectors had different sized spool spindles, hence the fact that cinema films here would always travel on cores, and at the receiving cinema it would be mounted on spools, and eventually returned on cores. Click to see a platter and separate projector. See? I didn't know that, thanks Maurice. So, are you saying that some 35MM projectors actually do not have the arms for reels these days? I spent a few years in the 90s working in a five-screen multiplex. It was a new Odeon with Italian Cinemeccanica Victoria 5 35mm projectors which had arms to use 6000ft spools if needed. The projectors worked with Christie platters, they were exactly the same as shown in the photograph. Osi perhaps it might be best if you ask that it "not be on a core." My own 35 set-up at home doesn't feature "arms". Everything comes from a film transport sword/tower system. But said tower features a "dead" spindle on which I can fit a small platter or make-up reel (1800ft to 5400ft) to accomodate cores to spool film on one of the large 15000ft reels. Over here, films on cores is the most common method. Transport reels were already a thing of the past before 35mm was a thing of the past. 35mm film is usually shipped on "cores". This is a core. There are several methods of handling film on a core. 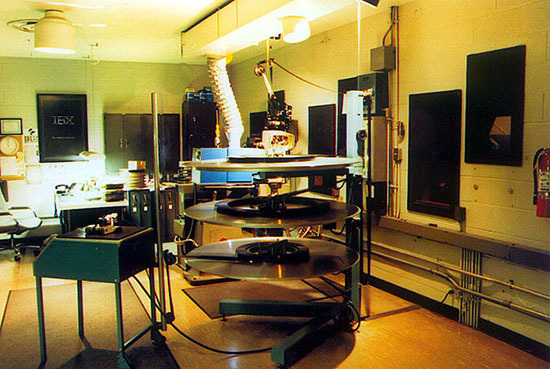 The most common is that the film on a core is placed onto one flange of a split reel. Second side of split reel is screwed onto the first. 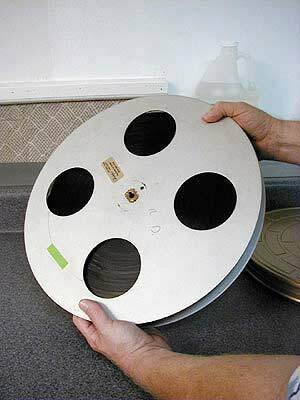 The film is now on a "reel" and can be run reel-to-reel on a projector, or rewound onto another reel, etc. 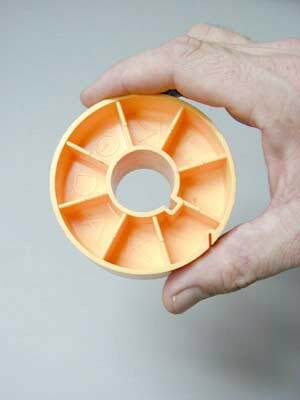 Trailer flanges can also be used to transfer a roll of film from a core to a reel (or from a reel to a core). I've never been in a projection booth or a private home setup capable of running 35mm that couldn't run a film supplied to them on a core though. It's pretty much a requirement, almost as important as having a lens in the projector. Note that even in platter houses, the film has to be loaded from a "reel" of some sort, whether that is a solid reel, a split reel, etc. I would to ask Osi why he is thinking of buying a 35mm print.